Galaxy Shuttle from the Japan-only Victory cartoon series is a Holy Grail to many Victory series fans. It was released only in Japan and is pretty hard to find in good, unyellowed condition. Most Korean-made toys for the local market had to include the manufacturing details. If only these guys were still around, I would have tried to track them down for more info on the moulds! V is for Victory, maybe? Instructions ripped straight from the original. Let’s take a quick look at the real deal, to remind us what this figure is REALLY supposed to look like. (Photo from wilson-ng.blogspot.com) Pretty cool figure. I’m not a huge Victory fan, but I can see why so many collectors consider this their Holy Grail, and not just for its rarity. Who doesn’t love space shuttles?! And now, we have our KO version. Very interesting color scheme and wait a min…WTF is that star flower sticker where the Autobot insignia should be? Is it some reference to the North Korean flag? NO. It isn’t. After Korea was split in half at the 38th Parallel by the DMZ, South Korean companies and people were very careful to not appear as North Korean (and therefore Communist) sympathizers. Besides, much of what has been associated with North Korean design is a relic of the previously united culture, repurposed for its political and sociocultural devices. It is simply an element of Korean traditional design, dating back hundreds of years to the culture’s Buddhist roots. Red, white and blue works… sometimes. Add gold for some bling? The star symbol is most likely clipart of a flower seen from the top down, such as that of a lotus flower, a motif commonly used throughout Korea and other parts of Asia touched by Buddism. 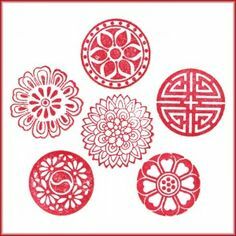 I couldn’t track down the exact same symbol, but here are some other pretty similar ones that are commonly seen in Korea. It could very well be the topmost flower design, minus the circular elements. These kinds of symmetrical patterns are used everywhere in Korean design, from furniture to clothing. Drink enough milk and you’ll get to 10 inches someday, buddy! The most unfortunate thing about this KO, like very many other KOs, is the brittle plastic used in making this reproduction. There is a ton of mould degradation as well, but that pales in comparison to the shoddy plastic they used for the colored parts. It almost feels like cheap toy model plastic or the kind of plastic used for those toys you get for Christmas from somebody outside of the family who picked up something from a mini-mart along the way to your house. I’m sure many kids broke this guy right out of the box after the first transformation. Well, not surprised as Haesung is a manufacturer of toy models and ripoffs of Japanese toys, sold for cheap prices. The perfect gift for your high school buddy’s kid! Hope you enjoyed this little post – I’ll keep hunting for more of these interesting KO’s from Korea and elsewhere as I find them. Hello, my name is Mike and I really enjoyed this article and all the great pics! 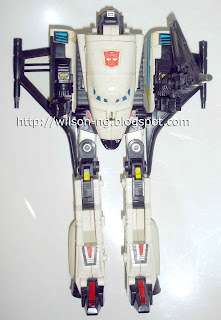 I love the mold, especially this KO, and I’m curious to know if it is available for sale or a tip as to where I might be able to acquire one. Please email me at: chezmyke1@gmail.com if you can help in any way. Thanks for your time and keep up the great work. Hey Mike! Thanks for the kind words. Unfortunately it has already been sold, but I occasionally find items like these on my trips to Seoul. I’ll keep an eye out for you. Yes, please do my friend. Even if it’s years from now please let me know if you ever find one. I have wanted one ever since I saw your page over a year ago and haven’t had any luck. Do you have any other KO transformers for sale that are like this? Yes, I do. Give me till next week and I’ll rustle up some photos for you when I get back from my biz trip. Thanks!